Happy September! Call me crazy but I am in 100% Fall mode- bring on the sweaters, changing leaves and pumpkin everything. September is much more than the beginning of Fall for us future attorneys: it is an LSAT test month. This means that for some, the most important test of their life up to this point is coming up fast. 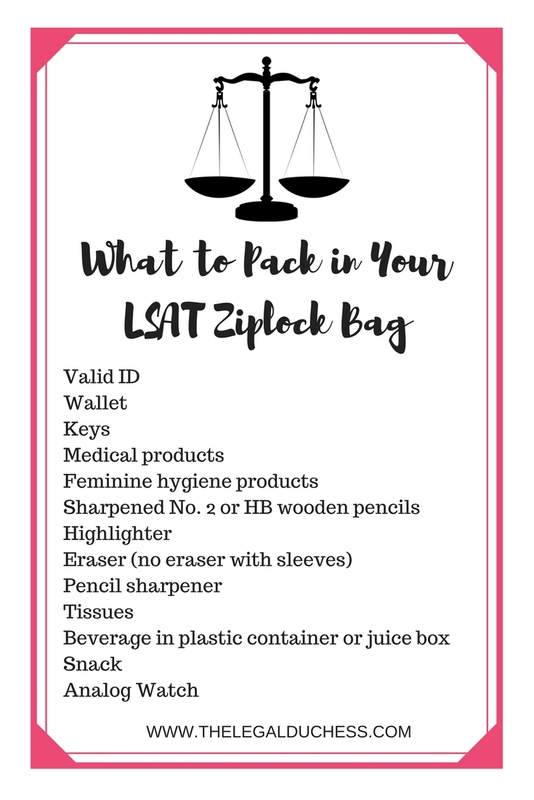 I decided to compile my list of tips for September LSAT takers (or any time of year really). I took the LSAT in September of my senior year. By the time I took the LSAT, I already had all my applications complete and simply needed to LSAT score for admittance. I knew I had to get the score I wanted on the first try in order to be eligible for full tuition scholarships at my target schools and that is exacty what I did. If you need a refresher, the LSAT is the Law School Admission Test. 98.5% of law schools require you to take this test for admission (a few schools accept the GRE in its place). The test consists of five 35-minute sections of multiple-choice questions. These sections include one Reading Comprehension section, one Analytical Reasoning section, and two Logical Reasoning sections. The unscored section typically is used to pretest new test questions. The placement of this section will vary. Identification of the unscored section is not available until you receive your score report. A 35-minute, unscored writing sample is administered at the end of the test. Copies of your writing sample are sent to all law schools to which you apply so it is important to still put out a good sample. It has always bothered me that she says "LSATs"... its singular!!!! It is a brutally hard test that requires tons of studying and is a huge deciding factor in your admittance to law school. The first step in registering for the LSAT is deciding on a testing date- they offer the test 4 times a year in various locations. Additionally, you must sign up on www.lsac.com to register for the test. Your target schools all have threshold LSAT scores that will get you admitted and a threshold score for scholarships. Determine where you want to be and work toward that target score when studying. 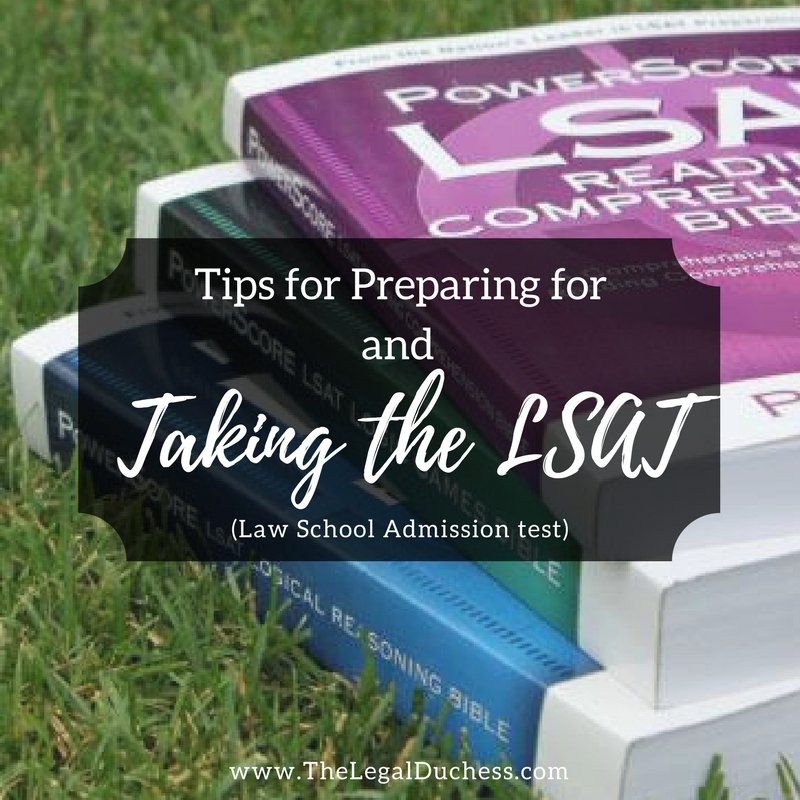 The LSAT should not be taken lightly and here are my tips for taking and succeeding on the LSAT. Studying for the LSAT is a long process. I would suggest starting to study for your test 4-6 months before your test date. The LSAT is designed to test you on your logical and analytical thinking skills... these do not come naturally and can be difficult concepts to learn. 2 weeks of cramming simply will not get you a good test score unless you are a super genius. The more time you give yourself to study, the higher your chances of success will be. I started studying 5 months before my exam and I was very regimented and studied vigorously for 5 months to ensure I got the test score I wanted and needed. You have to put the time and work into the LSAT- it is designed to rigorously test your analytical and logical reasoning skills... that takes hours and hours of preparation to master. Let the people in your life know that for the next few months, the LSAT is a priority and ask them to respect that and its importance to your future. The earlier you start studying and the more serious you are about it, the better your test score will go. Every person is different and not all study methods work for everyone. There are various ways to study for the LSAT: self-study, paid study course, hired tutor, group class, etc. Personally, I self-studied using the LSAT Powerscore Bibles. I did not have the money to pay for a class or online course so I made do with my resources. Self-study is great if you have the willpower to put the time in. I allotted an hour a day, 6 days a week for 5 months before my September LSAT test. As the test grew closer, I upped my study time until right before the test I was studying 3-4 hours a day and taking a full, timed practice test weekly. Everyone is different so what worked for me may not work for you. Know yourself and know what you need to do to be successful. It is a very important test and figuring out that your study technique did not work on test day is a little too late. The most helpful thing I did while studying for the LSAT was taking lots of full, timed practice tests. Once I had studied all of the basic concepts and had a firm grasp on them, I started taking a full, timed practice test every other week. About a month out from my test date, I upped this to one full, timed practice test a week. By the time I sat for my LSAT test, I had gotten my target score on my last three practice tests and I was feeling pretty confident. When I say full, timed practice test I mean exactly that- I locked myself in a study room at my undergrad college, set a timer and proceeded to take the practice test in as similar of conditions and time constraints as I would experience on the actual exam. I got familiar with my analog watch and keeping track of my time that way as that's what you have to do on the test. It helped me to get a feel for my timing and how fast I needed to work as well as building up my mental endurance. I also was able to gauge if I had studied enough and if I was prepared enough from my scores- when my scores started to near my target score, I knew I was getting close. I also could identify weak areas on the test where I needed to study harder and get more familiar with the material. When I took my LSAT, I finished each section early with time to double check my answers. I was also surprised that at the end of the test I did not feel nearly as drained as I thought I would; I was able to finish the whole exam within the time limit and with my mental facilities still going strong. I attribute both of these things to my practice tests and the familiarity I had with the test and testing conditions. I cannot stress enough how vital full, timed practice tests are to success on the LSAT. I suggest buying one of these practice tests books and getting to work! When you chose your test date, you will be given a list of locations to chose from. They administer the tests all over the place so you should have one close to you. Map how far the location is away from you and add 30 minutes to that to allow yourself plenty of time to arrive and account for red lights, traffic or in my case, a last minute stop for chapstick because I was going crazy from chapped lips on the way to my LSAT test. Print out a Mapquest just in case your phone GPS stops working or goes dead- you cannot be too careful! I suggest making sure you know where exactly the test is being held (in a law school, undergrad college, convention center, etc) and call to find out exact directions to where the test room is. This will keep you from arriving and walking in circles trying to find the test room on a huge campus. Additionally, if your test location is more than 2 hours away, you may want to consider a hotel for the night before to ensure a good nights sleep and a timely arrival. I was lucky and only had a 20-minute drive to my LSAT test location. Your LSAT test is extremely important. Making your test day as smooth and simple as possible will help you to do your absolute best. The week before your LSAT test, I highly suggest taking at least one full, timed practice test and light studying. It is too late for last minute cramming so rely on the work you have already done and try not to stress. Try to get lots of sleep to go into test day extra rested. Let the people in your life know that this week is very important to your future and encourage them to please respect that and respect whatever it is you need to do. Pamper yourself a bit- you need your stress levels at an all time low so you can just go rock the test without psyching yourself out. I was a little extra and made a "pump up" playlist for my 20 minutes drive to my test location. I rocked out to Taylor Swift, Katy Perry, Kesha and Lady Gaga all the way there! Whatever you need to do to go into LSAT test day feeling your best self- do it! This is an important test and deserves some extra special treatment. Set multiple alarms- you do not want to oversleep and miss your test! Make a pile ready for morning with your admission ticket and photo ID and lay it out with keys and ziplock bag for a quick grab in the morning without forgetting anything! Arrive early – plan to arrive early to the test center to avoid additional stress caused by traffic, parking, and finding the test center. Those who arrive late are not admitted for any reason. Be prepared that the test center may be too cold or too hot by dressing in layers, but per LSAC policy, leave the hoodie at home. Dress comfortably! I wore leggings, moccasins, a soft t-shirt and a thick cardigan for my LSAT exam. Have materials ready (pre-sharpen those pencils people!!! Take a few deep breaths and relax! Feminine hygiene products- never hurts to be prepared ladies! No. 2 or HB wooden pencils ONLY (no mechanical!) Make sure they are SHARPENED and bring lots!! For my test, the poor girl next to me brought only mechanical pencils and started to have a breakdown before the test. Because I had brought about 20, I slid 3 sharpened wooden pencils over to her, saw huge relief on her panicked face and was so glad I could lend a hand! Highlighter- I suggest yellow just to be safe and simple but don't go wild with it on the test. Tissues... it's like they expect us to start crying? Just kidding, no one wants the sniffles during the LSAT nor does anyone want to listen to your sniffles. Beverage in plastic container or juice box (maximum size: 20 oz/591 ml)—no aluminum cans or glass containers permitted. I took an apple juice box with me and it was perfect for the break. Snack. It's a long test and you want to keep your energy up and not have a rumbly tummy. I brought two granola bars for my snack and it was just right. Analog watch- I suggest taking an analog watch that you are familiar with because it will help keep your timing on track for the sections. The LSAT is extremely important and proper preparation is key. If you have prepared well, you should do well and the score will be what you need. However, unexpected things happen- you get sick, you get nervous, the person behind you won't stop clearing their throat through the test....sometimes sh** happens and you do not perform to your standards and don't get the score you want/need. This is NOT the end of the world. You can take the test again and you can always improve your score! One test does NOT decide your future. It's important but not all-important. Step back, regroup, re-engineer your study techniques and try again. This process for studying and taking the LSAT worked well for me- I got the score I needed to be accepted into every school I applied to and was awarded several full-tuition scholarships. Hard work pays off- I promise! Study hard, relax and rock that LSAT. You can do it! Best of luck to all future LSAT takers! May the odds be ever in your favor! I take my LSAT the 16th and even though I've been studying for the past 3 months my nerves are still at an all time high. Do you feel as though law schools might not take me as seriously if it takes me a try or two to get a good score. I just feel as though regardless of what I get the first time I will do much better the second time. Am I crazy to think admission offices will look down on multiple scores? Hi Olivia!!! If you have studied for 3 months I am sure you are much more prepared than you feel so try to not be so nervous. I know many people who turned in more than one score and were accepted. It may require you to write an addendum to your application explaining what happened with the lower score and why you decided to retake. Law schools understand that we are humans and sometimes have bad days and bad tests. But I am not an admissions expert so take that with a grain of salt and may consider contacting the schools you are interested in and asking their opinion. Best of luck!! Hi Brandy! I've been following your blog for a few weeks now and I love it! It's so hard to find law school insight like yours online! I noticed that you mentioned you received several full-tuition scholarships (which is my goal!) and I was wondering if you could tell me what type of things you were involved in while in undergrad? I know that my GPA and LSAT score are some of the most important parts, but I'm wondering what else is important? I am just so pleased to find these tips for taking LSAT. I am also aiming to crack this test so that I can get admission in the best law school but I think passing it is not that easy. I will collect the best preparation books for this and even can enroll with the online pre course.